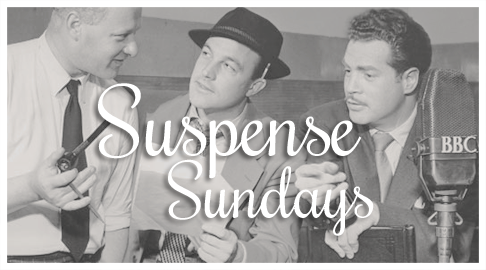 Suspense was a radio series from 1942 to 1962. I have a fondness for "Old Time Radio" as we call it now, and Suspense is my favorite show. It sets up weird, dark, scary, or intriguing stories with a plot twist in the end, and all in half an hour. For Suspense Sundays I'll give a short review of an episode. "An Occurrence at Owl Creek Bridge"
Based on the short story by Ambrose Bierce, the story begins with a Confederate sympathizer about to be hanged from a bridge by 'them Yankees'. As he is dropped the rope of the noose snaps and the episode is mostly about his thoughts as he makes his escape. Things turn nightmarish as things aren't as they seem, and the brilliant twist in the end is a huge dose of sobering reality. This is a classic short story and really stellar storytelling, which I think doesn't quite come across in this episode. I think it would have helped to have heard more of a distinction between the man's memories and what he was experiencing. Perhaps this story is just better suited to a visual adaptation so the twist in the end will have more impact. (The Twilight Zone did a fantastic version of this story.) Vincent Price did a great job narrating it though. If you have never experienced this story, I highly suggest looking it up for a quick read, or watching the episode of The Twilight Zone. But Suspense did adapt this story two more times, so maybe the other episodes will capture this intimate, tragic story better. New Blog Design + a Giveaway!